Crispy, spicy, sweet with just a touch of saltiness, these little golden nuggets of deliciousness are so addictive you may end up eating the whole batch yourself. 1. Drain the tofu (you can put something heavy on it after draining it initially to get more liquid out) and cut into 1/2″ cubes. Put the tofu into a large ziploc bag. 2. In a small bowl, whisk together the honey, sriracha, teriyaki, olive oil, adobo seasoning and mirin. Pour the mixture over the tofu and marinate for at least 30 minutes (no more than 2 hours or the flavor will be too strong). 3. While the tofu marinates, preheat the oven to 350ºF and line a baking sheet with parchment paper. 4. Take the marinated tofu out of the bag (leaving any excess liquid) and put into a large bowl. With a fine wire mesh strainer, sift the cornstarch over the tofu and gently toss until well coated. 5. Place the tofu on the baking sheet and bake for 45-55 minutes, (flipping the tofu every 10-15 minutes) or until the tofu is lightly browned and crispy. 6. Remove from the oven and sprinkle some coarse salt on top before enjoying. 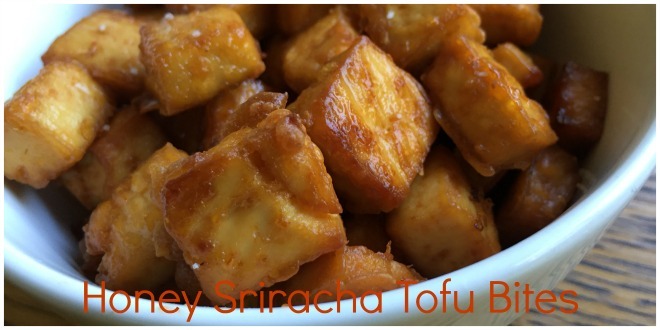 Do you eat this tofu on it’s own or serve it with any else?? Looks delicious! Thanks! I ate it as a snack, but it would make a great meal with stir-fry vegetables and some rice or quinoa.